As every year on January 5th, Pocoyo will participate in the Three Wise Men parade with the Clan TV float. 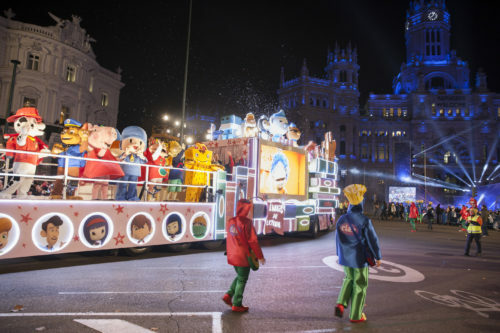 The Three Wise Men parade, a night full of magic, joy and thrills for the whole family, and especially for the youngest members, will begin at 6:30pm at Paseo de la Castellana (Nuevos Ministerios corner with Plaza San Juan de la Cruz), where children’s favourite characters will be present, including Pocoyo. Along the parade route, Clan TV’s float will be handing out gifts of their animated characters to the kids, including products from Pocoyo and his friends. The parade route will be the following: it will begin around 6:30pm at Paseo de la Castellana (Nuevos Ministerios corner with Plaza San Juan de la Cruz), continuing on to Plaza del Doctor Gregorio Marañón, Paseo de la Castellana, Glorieta de Emilio Castelar, Paseo de la Castellana, Plaza de Colón, and Paseo de Recoletos, ending at around 9pm at Plaza de Cibeles with fireworks above Palacio de Cibeles. People are advised to come at least one hour before the parade’s beginning in order to get a good spot and to be able to see it without any rush.